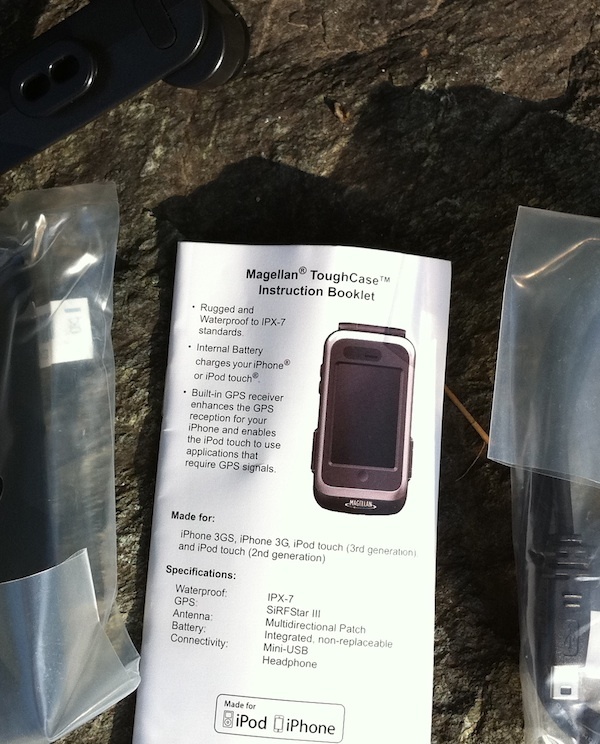 Magellan produce quite a few road navigation GPS units, as well as some very decent outdoors gear. 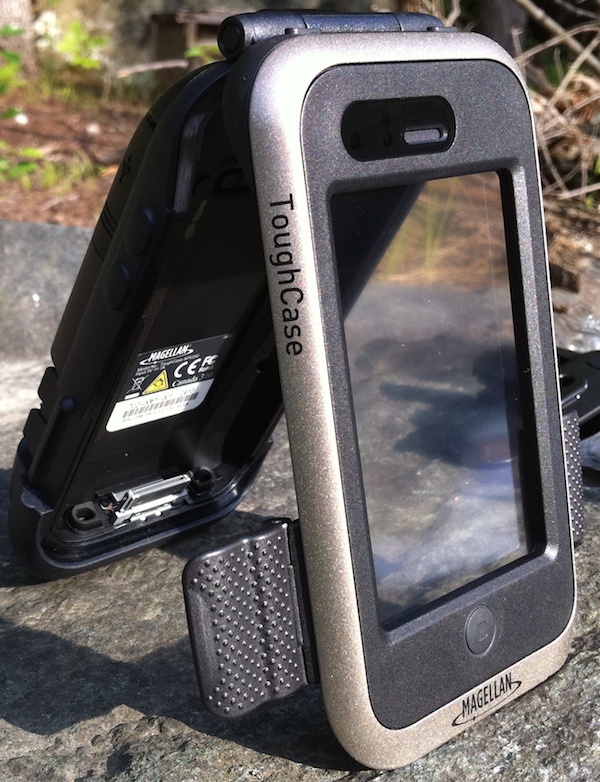 We were recently asked to review a novel product - the ToughCase for the iPhone and iPod Touch. As you may know Magellan was recently acquired by MiTAC (together with Navman) to complement the Mio brand. So far this merger doesn't seem to have affected Magellan's branding, and the market share in the US doesn't seem to have suffered either. 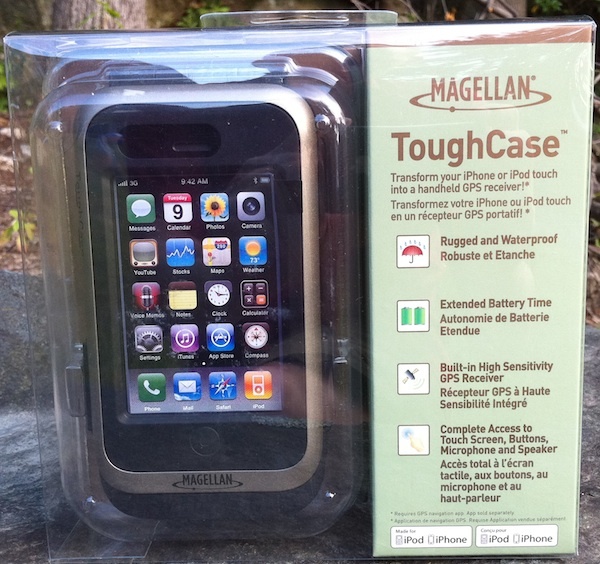 The ToughCase is a bit of an adventure for Magellan as this is the first time they provide a shell for another device. 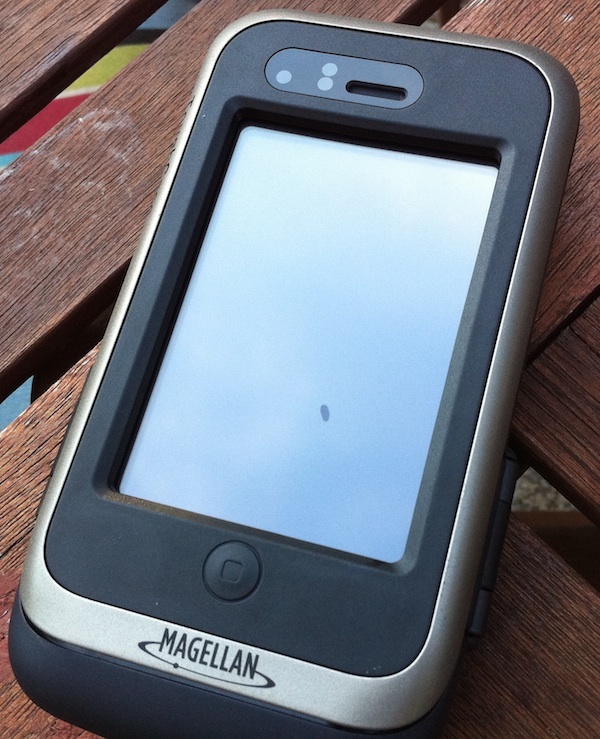 Of course Magellan is quick to note that their software does run on the iPhone and iPod Touch just well. OK, let's look at the test object. 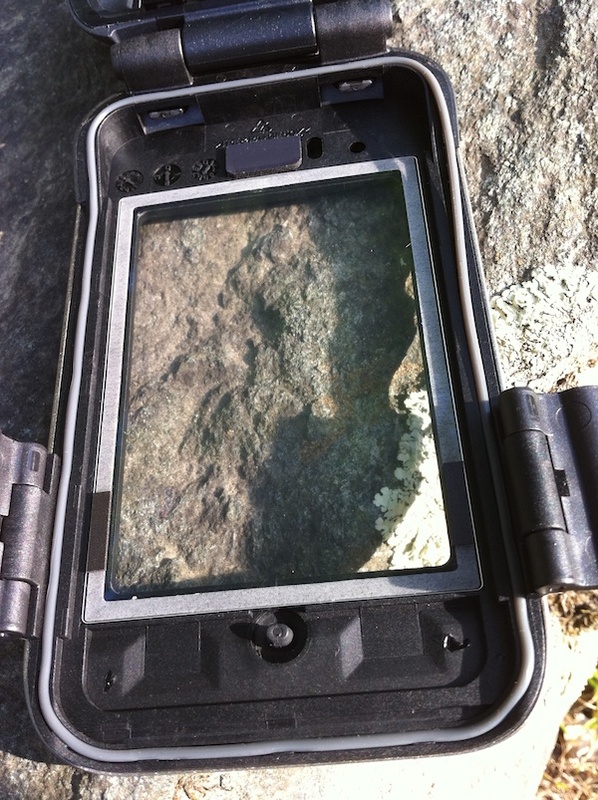 The ToughCase comes at a steep price, and it needs to prove that it is worth the money. The unit can be ordered online but as you can see it is also sold in conventional electronics stores, as well as big retailers. Together with the unit you will get a instruction booklet (this is required reading as some of the buttons are not obvious), a back adapter for the iPod Touch (left), a USB cable (right) and a rather flimsy belt clip adapter (top). Why flimsy? Well, the ToughCase is definitely heavy and the belt clip is more designed for lightweight phones. So far the clip is holding on fine but I always expect it to break in the next minute. It's much more comforting to toss the ToughCase into a bag, or to use a neckstrap for it. The ToughCase itself is anything but flimsy. The product looks well manufactured, and sturdy enough to endure quite some heavy use. 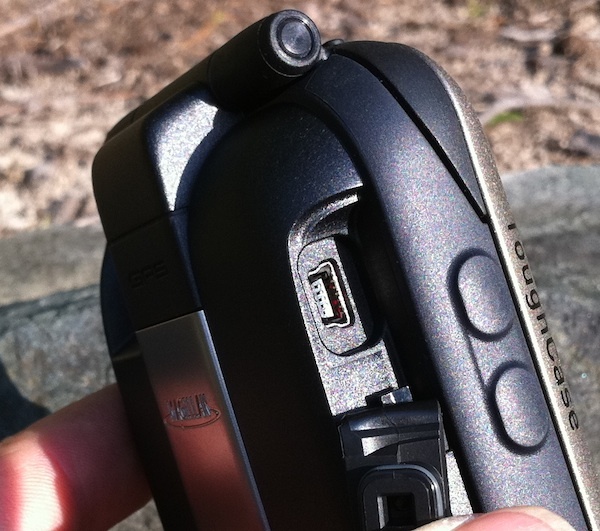 The externally accessible ports are protected by flaps as well as additional O-rings inside the flaps. 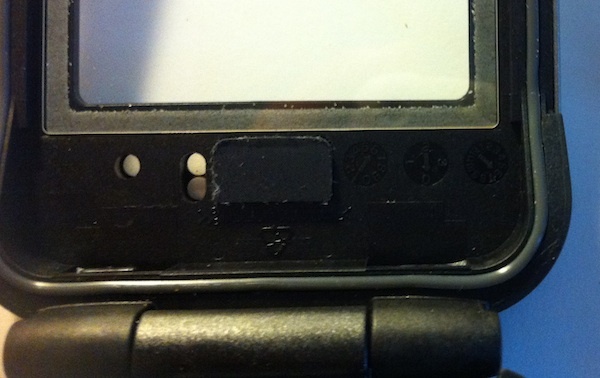 There are see-through openings for the iPhone sensors. Speaker and microphone are protected by watertight membranes, and the audio from and to the device is guided through rubber channels. 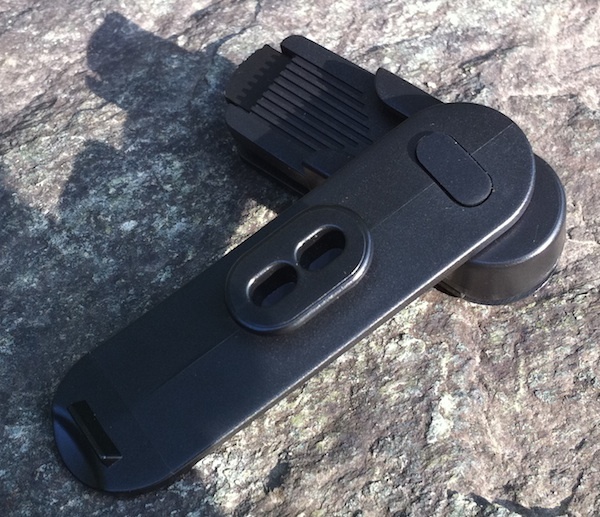 The dock connector swivels to the front for easier insertion and removal of the device. Here is a little Insertion video (26MB MOV). This is visible mostly when the device screen is off, and it doesn't affect the general function of either the iPhone/iPod Touch or the ToughCase. It certainly is not caused by moisture seeping in through the seals. In the picture above you can see the main O-ring providing the seal between the two case halves. As the instruction manual states you should be very careful not to damage this piece. Since the actual power switch is located in different places on the iPhone and the iPod Touch the ToughCase provides button actuators for both. Magellan had to make some design choices. 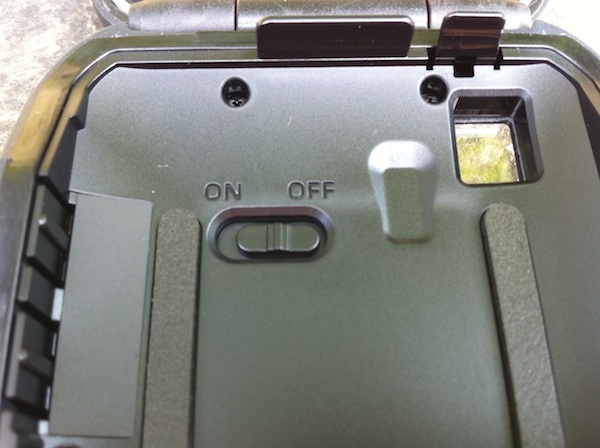 The Mute-switch is not accessible from the outside, and neither is the headphone jack. Headphones can be connected despite that because the audio is routed from the dock connector. The internal microphone on the iPhone will work albeit at a somewhat lesser rate, but microphones that use the headphone jack will not work. Overall I would think these are acceptable tradeoffs. You may have to talk a bit louder when doing a phone call - and you will look funny with that brick on your head. 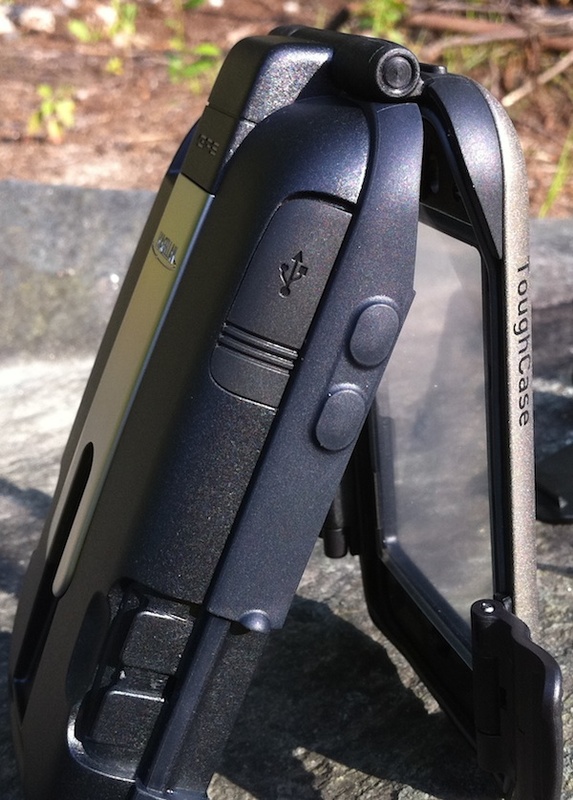 The ToughCase review unit is specifically designed for the shape of the older iPhones. If you have a (thinner) iPod Touch you can use the provided back adapter. 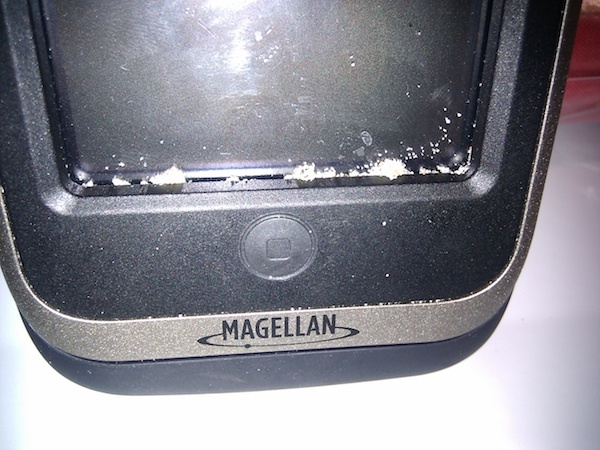 If you have an iPhone 4 you can either ignore the warnings and use the ToughCase (it kinda sorta works, minus some buttons and with a slightly obstructed camera window) or you should probably wait for Magellan to redesign the case to fit the iPhone 4 as well. Of course this is not so much Magellan's fault. It is rather attributable to the über-secrecy of Apple who reportedly refused to give any measurements of the iPhone 4 to case designers before launch. However, even for the iPhone 3G(s) some of the actuators are not optimal. Below you can see that the "Volume down" actuator does not center on the actual "Volume Down" button of the iPhone 3G . The ToughCase has a few buttons and switches to control the functions. First there is the Master switch inside the case. From what I understand this switch totally cuts off the battery. This may be good for storage of the ToughCase over longer periods, but it's no good when you actually need to charge the battery. For that the switch needs to be in the "ON" position. On the bottom of the case are the buttons for checking the battery level (left) and for changing the case function (right). When charging the four battery LEDs will produce a light show but they won't actually tell you how far the charging has advanced. If you keep the iPhone in the ToughCase during charging, and use a less potent charger (around 1A for example) you may not actually charge the ToughCase at all. A workaround is to detach the USB cable every now and then and check the battery charge level. It is worth mentioning that removing and re-inserting the iPhone will revert the status back to "Charge" if the status prior to removal was "Charge/GPS" or "OFF". Switching between the power modes is easy, but forgetting which mode you are in is too. So if you want to preserve some battery power for that special situation then you need to watch your iPhone charge indicator to see if the external battery is engaged or not. Don't expect wonders from the external battery either - in our tests the iPhone battery could be recharged only once from a fully loaded TouchCase battery, and that was without using the ToughCase GPS. So if you are hiking along and the iPhone GPS has you on the map somehow you may not want to engage the ToughCase GPS just yet. Of course this is a non-question when you own an iPod Touch - here the ToughCase GPS is your only option. But, but - is it really waterproof? We leave the answer to that question to our half height testers (aka ankle biters). All tests were conducted with a live and working (before, during and after!) iPhone 3G inside the ToughCase (OK, the risk was somewhat mitigated by the fact that the moisture sensor on said iPhone had already triggered a while ago during an attempted escape through the bowl, but that is only relevant as much as it reduced my anticipatory hesitation a little). As you can imagine given the weight of the case components (plus the iPhone payload) the case will not float. It will protect your iPhone for a while down to a certain water depth (the IPX-7 spec means immersion in one meter of water for up to 30 minutes), but you need to tie it onto something useful when you drop the ToughCase in less shallow waters. 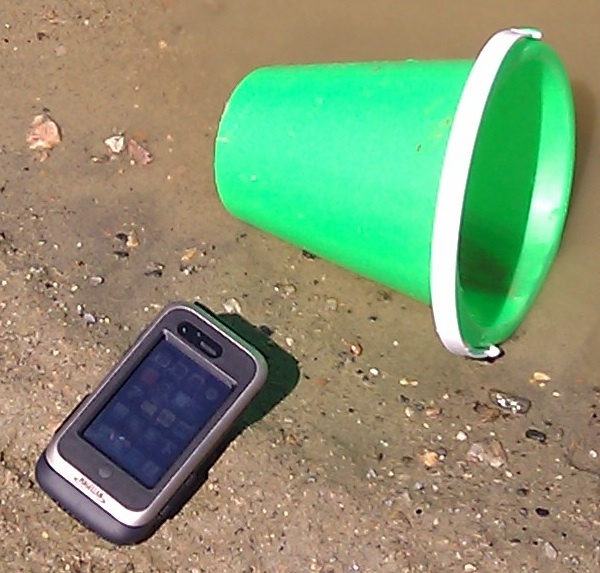 During the beach tests the ToughCase also had to deal with excessive amounts of fine sand. None of the little granules made it into the inside of the case. Some of them got stuck behind the screen protector but they flushed out nicely with a bit of forced water. Yes, the ToughCase is expensive. However the tests have shown that it is well worth that money to protect your precious iThing from the nasty outdoors. You will lose some functions (like the mute switch) but most of them aren't needed when roaming around in the wild. What you will need is a reliable GPS receiver, and some extra juice for the occasional emergency. The ToughCase has you covered on both accounts. Some of the design and the power mode functions could be improved. Hopefully this will happen when the ToughCase is adjusted to accept the iPhone 4. The charging process and the indicators certainly can use some improvement. The ToughCase is waterproof and dustproof. it is available from the Magellan site for USD 180.